Recently, television host Wendy Williams got a special cocktail - a vitamin cocktail in the form of an IV vitamin drip. Another name for the cocktail she received is a “banana bag,” and it usually contains “a combination of 100 mg of thiamine, 1 mg of folic acid, 1-2 g of magnesium, and a multivitamin formulation in either normal saline or dextrose in water solution,” according to this source. A banana bag is generally used for a very specific medical purpose - chronic alcohol use disorder (AUD). In the past, Williams has shared that she struggled with a cocaine addiction that lasted 10 years. She was able to overcome this and become a highly successful and popular TV personality. But now, unfortunately, she appears to be battling an addiction to alcohol and, according to some reports, prescription drugs. Reportedly, just one week after sharing on-air that she had been living in a sober home, the 54-year-old host had to be hospitalized after checking herself out of the sober home and drinking heavily. She was said to be taken to the hospital after members of her staff found her very drunk. As we have discussed before, intravenous (IV) vitamin drips deliver a cocktail of nutrients directly into a person’s bloodstream. IV delivery of nutrients and medication is routinely utilized in the hospital setting for treating patients. These intravenous fluids may also contain potassium, glucose, and sodium, which are electrolytes your body needs to function normally. Medical professionals sometimes use IV lines to deliver drugs directly into the veins. This form of delivery helps the drugs reach the bloodstream more quickly than they would if you took a capsule or tablet. IV drugs are also useful for treating people who are vomiting and cannot take oral medications. So it's not surprising that IV lines are also being used to deliver nutrients. And you don’t necessarily have to be having a medical issue or an emergency to utilize IV vitamin drips. Many people may use IV drips to help prevent or reduce the symptoms of the common cold, a hangover, jet lag, fatigue and more. The nutrient-filled fluid in a banana bag has a yellow color, hence the name. The nutrients identified above that are present in the bag are all essential to the proper functioning of our bodies. Vitamin B1 (Thiamine), 100mg. Thiamine is an essential nutrient for all the tissues in the body, including our brain tissue. “A deficiency in the essential nutrient thiamine resulting from chronic alcohol consumption is one factor underlying alcohol–induced brain damage,” reports the National Institute on Alcohol Abuse and Alcoholism. Vitamin B9 (Folate), 1mg. Abusing alcohol usually causes a folate deficiency, which can lead to anemia (a decrease in the red blood cells). This nutrient deficiency may also lead to psychosis, agitation and sleep issues. Magnesium, 1-2 g. “Magnesium (Mg) deficiency is common among alcoholics. Animal studies have shown that magnesium deficiency aggravates the hepatic [relating to the liver] damage caused by alcohol. One study on chronic alcoholics suggested that magnesium supplementation over six weeks decreases abnormally high activities of three enzymes related to liver function,” according to the National Institutes of Health (NIH). A banana bag may also contain a multivitamin, which makes sense considering how badly alcohol robs the body of vitamins we all need to stay healthy. All the nutrients mentioned in the banana bag may help prevent or reduce the likelihood of additional alcohol poisoning and withdrawal symptoms, such as prolonged vomiting, dehydration and low blood sugar. Another popular cocktail in the world of IV vitamin drips is the Myers’ Cocktail which may also be used to cure the effects of a hangover. 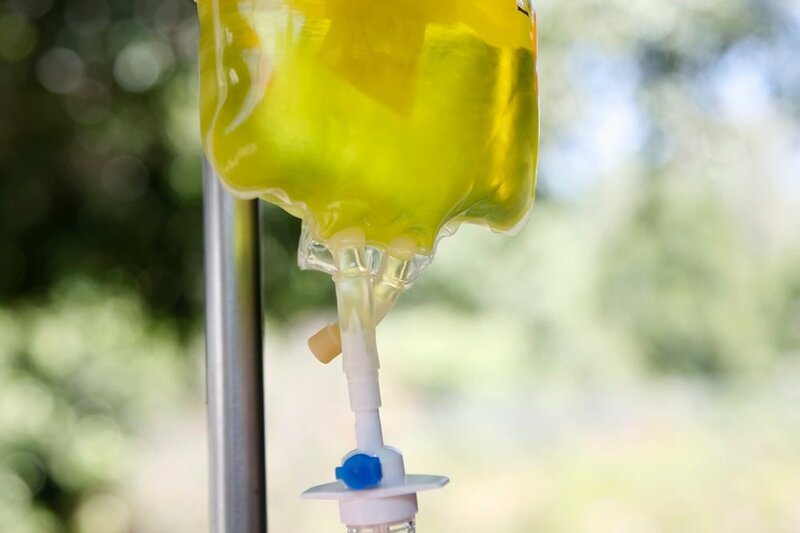 Some medical practitioners “prefer vitamin IV infusion over oral administration, because higher vitamin levels can enter the bloodstream via the veins than can orally.” Factors such as age and diet may affect our ability to absorb adequate amounts of nutrients from the foods we eat to stay healthy. As a result, obtaining nutrients via infusion is an option that may be used to ensure that we get the right amounts of nutrients we need. You can read more about potential benefits of the Myers’ Cocktail and additional cocktails we offer at the pH Drip Lab, here. I’ve never been much of a drinker, but these are “cocktails” I utilize often as I age to replace lost vitamins and minerals and help boost my nutritional status. Whether or not we are battling addiction like Wendy Williams, we all likely have challenges maintaining optimal nutrient levels. These challenges are due to a variety of factors, including medications, surgery, chronic illness as well as age. When you have these challenges, it is important to consult with a competent healthcare practitioner to identify the best way you can be nutritionally balanced. I have benefited from infusions of Vitamins C and B because I have such difficulty absorbing enough of these vitamins from food or supplement form. There is enough evidence to suggest that infusions may indeed be worth the hype and the benefits may far outweigh any risks associated with them. So if you have confirmed that you are deficient in certain nutrients and want to experience quick results, this may very well be one avenue you want to consider as a short term fix until you figure out a long term solution.